Thank you very much, Ms. Lucy. The site about Jane Avril has more detailed information. It's worth looking at. 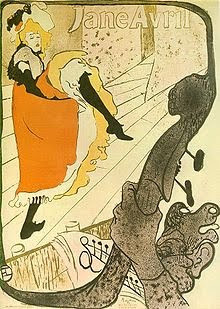 The more I see of the glamour of the Belle Epoque, the more I think it was brittle underneath. And not just Jane Avril's horrible family history. Or even Toulouse-Lautrec's horrible family history. But entire family fortunes lost on the Panama Canal Scandal; people addling their brains on absinthe every evening; prostitution and VD everywhere. 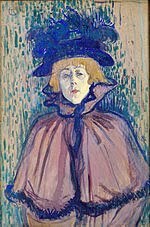 No wonder Toulouse-Lautrec saw some sort of soul mate in Jane Avril. Of course I am biased; I love redheads. I absolutely agree with you, Hels. When you look into the era, it was certainly a house of cards. The glittering surface is certainly very appealing, however. I have started to wonder if the advances in culture, politics and society could have been made without the horrors underneath this house of cards.